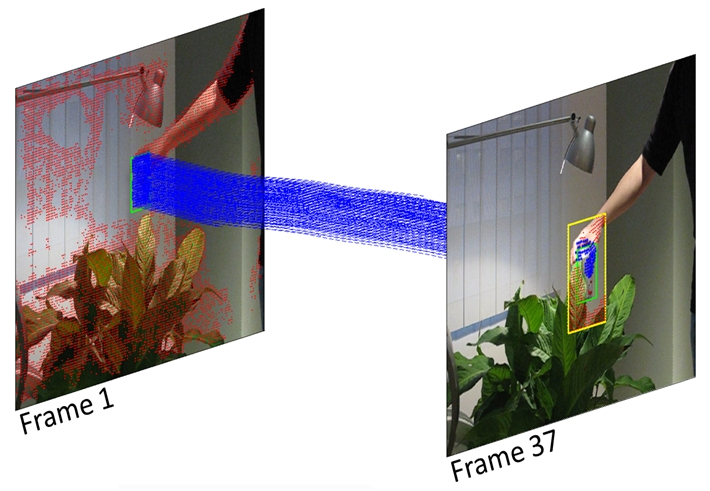 Abstract : Object tracking is a reoccurring problem in computer vision. Tracking-by-detection approaches, in particular Struck (Hare et al., 2011), have shown to be competitive in recent evaluations. However, such approaches fail in the presence of long-term occlusions as well as severe viewpoint changes of the object. In this paper we propose a principled way to combine occlusion and motion reasoning with a tracking-by-detection approach. Occlusion and motion reasoning is based on state-of-the-art long-term trajectories which are labeled as object or background tracks with an energy-based formulation. The overlap between labeled tracks and detected regions allows to identify occlusions. The motion changes of the object between consecutive frames can be estimated robustly from the geometric relation between object trajectories. If this geometric change is significant, an additional detector is trained. Experimental results show that our tracker obtains state-of-the-art results and handles occlusion and viewpoints changes better than competing tracking methods.